This piece is the first of two that examines the career and output of Robert Walker, an important figure in nineteenth century ballad-printing terms in Norwich, as the survey of his murder and execution ballads has already indicated. His work, together with that of his son, also Robert, spans a good deal of the century although, as will be seen in this first piece, there are certain aspects of investigation into the lives of each of them that are incapable of resolution at this stage. The second piece will concentrate on the conventional forms of single ballad-sheet-printing as we have encountered them throughout this series. Something of the jobbing side of printing is revealed during the course of discussion. The bones of a life for Robert Walker can be assembled from the usual sources. Census details for 1841 give us a Robert Walker, Printer, aged 50, living in Bridge Street, St Michael's Coslany with his wife, Ann, four children - one of whom, Robert (aged 16) is listed as 'Printer's Apprentice' - and James Mann, Printer, aged 24. All were born 'in county'. Mary, then aged 20, subsequently disappears from the family home (no other information concerning Mary has yet been found). Her sisters, Isabella and Henrietta, we will find, stay on. And at least a clearly established business can be perceived. The 'Bridge Street' address is investigated below in a discussion of the location of 'White Hart' in connection with Walker. The 1851 census has Robert Walker, aged 61, in Church Street, St Michael's Coslany as Printer Master, living with his wife, Ann, aged 52, and two daughters, Isabella (21) - working as a 'Binder' - and Henrietta (20). There is no mention of either Robert junior or Mary. In Robert junior's case, though, there is elsewhere further evidence of his career that complicates the Walker story and this will be discussed below. A civil registration death for Robert Walker was reported in June 1868. A group of street directories fills in some of the gaps around and between the censuses. Pigot's 1822-3 directory, for example, has a Robert Walker as 'Bookseller, Stationer, Binder and Printer' at St Andrew's, Broad Street. Pigot's 1830 directory lists Robert Walker as printer at St Lawrence's Steps which link St Benedict's and Westwick Street, to the west of the city centre. The christening of both Henrietta and Isabella at St Lawrence in 1827 and 1829 respectively - St Lawrence's church is located on the other side of the steps from the spot that would appear to be where Walker's own premises were situated (see photograph 3, below) - hones in on the period spent at St Lawrence; and details on copy help to fill out the parameters of dating. 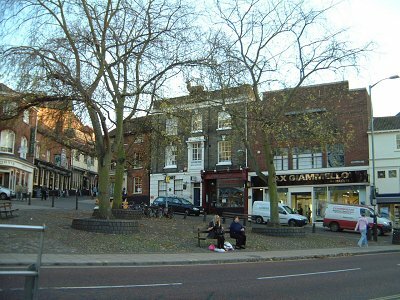 Before 1827 the christening of Walker's other two children, Mary (1821) and Robert (1825), in St John Madder Market, gives us a likely district in Norwich for domicile south of the Duke's Palace from where many of Walker's first independent pieces were issued (still in the city centre, near to Bridewell Alley where Walker first printed with Robert Lane, as discussed below, and, as it happens, not at all far to the east of St Lawrence). White's 1836 directory has Walker in Timberhill, south of Norwich Castle, the only time that Walker is found elsewhere than in the north-and-west-central part of the city. White's 1845 directory has a Robert Walker in 'Oak St'. This address is outside Norwich city centre and to the north of Coslany. There is a problem here, to do with Walker printings coming out of both 'White Hart', St Miles' (the diminutive form of St Michael's) and St Martin at Oak, apparently at the same time, as will be seen when detail from copy is examined below. It does seem as if Oak Street and St Martin at Oak were one and the same. Oak Street 'begins' as a northward extension of Coslany Street. The church of St Martin at Oak is situated in Oak Street at the junction with St Martin's Lane (see map - which actually shows Oak Street as 'St Martin at Oak'; photograph 6; and further discussion below). So who printed out of the two addresses? For, following on from the apparent confusion of location noted above, we find that Mason's 1852 directory lists two Robert Walkers. The first is as 'Printer and Bookseller', operating from Church Street, St Michael's, Coslany, which would fit the census details for Robert Walker senior given above. But Mason also has a Robert Walker at 'Bridge-st, St George's' on the north side of the River Wensum. Although Bridge Street is not found on modern maps St George's Bridge is and there is little doubt that the street is the same as that on the Muskett 1849 map given in text below. The point is that the Robert Walker in question can surely only be the son, Robert Walker junior, then aged 26 (again, see further below). Church Street, Coslany, does not now exist but a late nineteenth-century street directory, Eyre's, in 1883, lists Church Street, St Miles' as linking the present Colegate Street and Coslany Street. 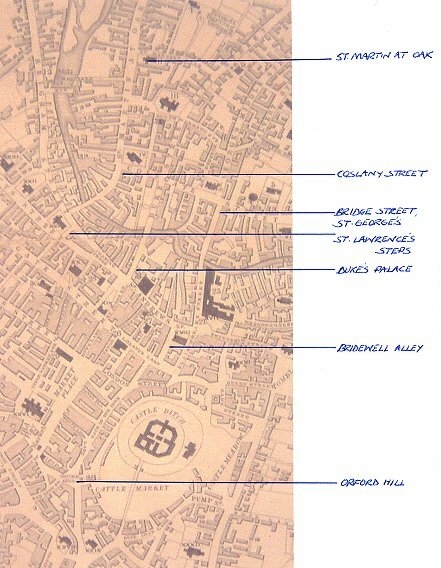 The accompanying map does not reveal this - we see that Colegate Street runs directly into Coslany Street. 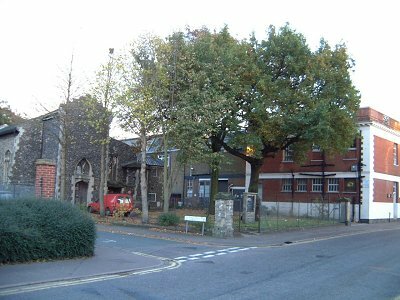 A possible explanation is that Church Street constituted the western end of Colegate Street at the time of Walker's residence at White Hart; or, alternatively, that Church Street formed the 'bottom' part of Coslany Street and ran across the 'gable' end of St Michael's church, south to north. The street may also have entirely disappeared as the city changed. White's 1854 directory lists a Robert Walker as printer at 'St. Mile's Church st' (sic) in the general Coslany area which address looks once more to correspond with census details for Walker senior; and this address might confirm the relative positions of Church Street and Coslany Street. White also lists 'Robert Walker jun', printer, at Bridge Street St Andrew's. 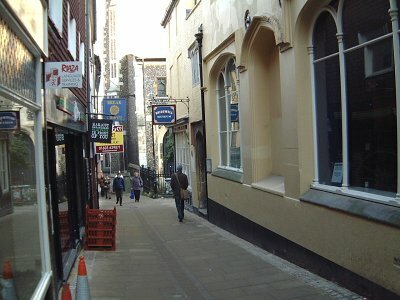 Bridge Street itself links St George's Colegate with St Andrews and we might assume a one and the same location. An 1856 directory, from 'Craven & Co', has a Robert Walker, presumably senior, in 'St. Mile's Church st' (sic). There is no mention of Robert Walker junior. Melville's 1856 directory has the same details. 6 Roger's 1859 directory has a Robert Walker as Printer and newsagent at 'Church Street, St Miles', Coslany'. White's 1864 directory has a Robert Walker at Church Street, St Miles. It does seem clear that this Robert Walker is the father and that all the addresses in directories as just adduced here coincide with his domicile in Church Street, St Michael's, Coslany and with the absence of the son, Robert, from the family home during the taking of the 1851 and 1861 censuses. Discussion below reveals Robert Walker junior's whereabouts. Kelly's 1865 directory has the two Robert Walkers, one as 'printer and bookbinder' at 'Church Street, St Miles' and another as 'news agent' at Bridge Street. These two entries confirm information about Walker senior in a familiar address and Walker junior at Bridge Street, St George's, as found in Mason (1852) and White (1854). Mathiesen's 1867 directory has Robert Walker junior at 'Bridge Street' as 'News Agent, Printer & Stationer' and 'Harrod & Co's' 1868 directory has a Robert Walker as printer and bookbinder in 'Bridge St, St George's'. 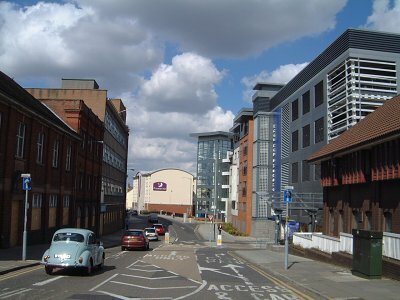 The two locations, of St Miles' and St George's, are sufficiently far apart for there to be no possibility that they are one and the same address. And, in view of the 1868 death certificate for Robert Walker, we can hardly doubt that it is the scion at Bridge Street. This would give us an explanation of sorts for anomalies that crop up on copy and as they are examined below. Kelly's 1869 directory, following White in 1854 and Mathiesen in 1867, has a Robert Walker, 'news agent', at Bridge Street - although in 'St. Andrew's'. This would appear to nail the link between St George's, Coslany and St Andrew's; and, further, we should be able to take all Bridge Street addresses to be one and the same. Finally, a series of electoral rolls in the Millenium library, stretching from 1847 up until 1872, make it more clear as to the whereabouts of the Walkers, senior and junior, as Freemen of Norwich. Although details for 1848, 1855, 1856, 1857 and 1861 are not available, Walker senior's address is given as St Michael's (sometimes 'at') Coslany for the years 1847, 1849-1854, 1858-1860 and 1862-1866 and Walker junior's as the same between 1849 and 1851 after which he is found at Bridge Street St George, Colegate until 1854. There is, though, a glitch - a marriage certificate, dated October 23rd 1849, for Robert Walker junior and his wife, Maria (Smythes), that has the couple marrying out of the 'hamlet' (so described in census details but, in actuality, heavily populated) of Heigham. It looks as if Maria was in her father's house (Theodore, a tailor) - though he is not listed in the 1851 Heigham census. The anomaly, given Walker junior's Bridge Street address between 1851 and 1853 according to the electoral rolls, remains. Then, in 1854, Walker junior's address is given (in the rolls) as Green Hills Augustine's Road, St Clement. In 1858 it is given as Green Hills, St Augustine's gates, St Clement (surely the same address) and this suggests that he was living there in the intervening three years. In 1859 and 1860 Walker junior's address is given as 'Augustine's road' again and in 1863 'Augustine's gates' again. Then he is in 'Pitt Street, St George Colegate' between 1863 and 1865 before, in 1866, he appears once more in Bridge Street. Walker junior remains at Bridge Street until 1871 when the address is given as 'Church Alley' and then yet again, in 1872, in Bridge Street. No known Walker printings exist from this period although the 1881 census has Robert Walker junior down as 'Printer' (see further below). As seen elsewhere in this survey some streets in Norwich went under more than one name or changed as the years passed. 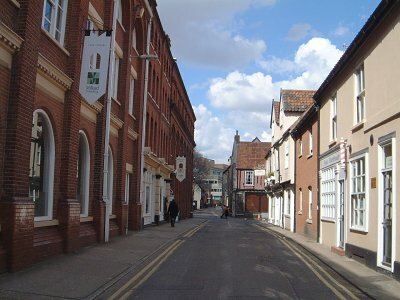 Church Alley here may have been part of Bridge Street or just off it; but the particular area of Norwich was the same and the known perspective on Walker junior's whereabouts remains the same. There is, though, one more unsolved problem here to do with the census details for 1851 that have Walker junior (aged 25) at '6 Golden Croft', St Augustine's, as 'Printer Compositor' living with his wife Maria, aged 25 and a son, Walter, aged eleven months. Obviously, this conflicts with the information on electoral rolls that he was at Bridge Street unless we take entries on the rolls to refer to business premises. For St Augustine's and St George's Colegate are contiguous parishes, not one and the same. We might have to assume a change of address during a matter of months. With regard to the one time when Walker senior is found south of the city centre, one electoral roll entry for 1837 has him at a 'House and shop' in Timberhill Street, Orford Hill; the only clear indication that domicile and business were at the same premises even if the St Michael's, Coslany address looks to be another instance. Timberhill and Orford Hill are actually joined at their northern end (see map and photograph 4). Otherwise, in trying to assess Walker's geographical wanderings, the stability of the St Michael's, Coslany address between 1841 and 1861 suggests a settling down until death in 1868. The accompanying map here may be referred to as indicating much of what is known about location so far. The first principal news of Walker's activity (but not quite the only news - one recalls the apprenticeship), according to details on copy, comes in a known association with a Robert Lane that might be located during the second decade (perhaps part of the first also) of the nineteenth century. The association was certainly a solid one and has already been mentioned in this series of articles. The two men printed together out of Bridewell Alley, St Andrew's until Walker moved to separate premises 'near the Duke's Palace' whilst Lane apparently continued to work for some time out of Bridewell Alley. ). Does this mean that 'and Co.' was Walker? These printings, by the way (so far unlocated), look to have been books - perhaps pamphlets - as opposed to ballad material. There is yet another piece, a single sheet, in the Bridewell Museum, Norwich, a sermon on death of H R H Princess Charlotte (by James Browne) that has a printed date of 1817 on it, having been issued by 'Lane & Co Bridewell Alley'. Charlotte was the daughter of George IV and Caroline of Brunswick who both feature in Walker output, as will be seen. Unfortunately, for dating purposes, one other reference (in Bibliotheca Norfolciencis) to a volume printed by Lane and Walker together - W Dodd: Reflections on Death - has a date of 1820 on it and this throws out general calculations and, together with information noted below, indicates that there must have been a degree of overlap between the time when Lane and Walker printed together and when they printed separately. There are yet other printings from Lane and Walker together listed in Bibliotheca Norfolciencis that do not give a printer's address - in total some twenty-five titles - and these are separate to dates for other Walker printings in the same volume, again without addresses but with dates ranging from 1823-1834. We can then work back and around in time from detail in these printings that, after all, amount to a considerable output and see that the period of joint activity can, to an extent, be circumscribed. More dates on various Walker copy - that is, apart from references in Bibliotheca Norfolciensis - of 1822, 1823, 1824 and 1826 (examples only) give his name as an independent printer and mirror the 1823-1834 dates for separate Walker printings in Bibliotheca Norfolciensis. Already, then, we have a general period during which Lane and Walker operated and then ceased to operate together. , giving the name 'R. Lane' as an independent printer. The date of this piece is confirmed by a copy of a jobbing advertisement in the Bridewell Museum for farming goods being sold at auction where Lane's printing address is given as 'Bridewell-Alley' and which also dates from 1818.
, which appears to celebrate the defeat of Napoleon in Russia in 1812; The Bombarding of Paris, a post-Waterloo piece; A crocodile's tears, issued when Bonaparte had been sent to Elba in 1814; The triumph of Peace, which is post-Waterloo, but gives no real indication of exactly when; and The Devil and Bonaparte. 10 Was Walker still serving his apprenticeship or just finishing it? Was he simply aiding Lane? Was he an instigator of printings? So far no evidence has emerged to provide clear answers to these questions. being reduced in circumstances was allowed to appear at the Theatre in the character of Hamlet. He succeeded in exciting the risibility of the other performers, and the loud laughter of the audience. Such an embarrassing fate indicate the economic level at which some printers and booksellers existed - perhaps not Walker and maybe involving individual profligacy, of course; but the two references, from Peck and Mackie, encapsulate the probable time of Robert Walker's apprenticeship and there appears to be no other Robert Walker and no other Payne to fit the bill of association. could even have been printed at quite a distance in time from the events (we know how Nelson material often appeared in this way) 12 in which case the independent dates of 1817 (for Lane) and 1818 (for Walker) given in Bibliotheca Norfolciensis - as noted above - and, perhaps, Christmas and then the 1820 Dodd volume, even with its inherent contradiction in terms of dating, all help to hone in on a period when Lane and Walker were working together and then when they separated. And the Pigot street directory entry for 1822-1823 with Walker at 'St. Andrew's, Broad Street' - which we might be inclined to take to be Bridewell Alley (in actuality the full address inclusive of 'Broad Street' was shortened in general usage as time went on) - holds up any rush to see Walker moved away from his first premises. The particular moment is still debatable although separate printing of pieces on the Queen Caroline affair of 1820-1821 (below) underlines a time of separation for the two printers. To compound this circumstance, there is an extensive set of material from the Bodleian Allegro archive (some pieces to be considered in more detail in a forthcoming piece) where there are thirty-three sheets issued with Walker's name in conjunction with that of Robert Lane (some sheets are repeats), that were all issued from the Bridewell Alley, St Andrew's address whose parameters of activity are now beginning to emerge and whose elimination as joint premises can be tentatively set around 1820 - although Walker, certainly, had already issued copy independently, in 1818 (see his piece on the fight between Painter and Sutton noted below). by members of the Whig-Radical element' and 'prior to departure' addressed 'a large meeting' at St Andrew's Hall. Chartism may be said to have been most important after 1839 and the National Convention, until 1848 when it had died as a movement. However, the movement itself actually 'commenced' in Norwich in October 1838. It must be added that Walker printed King O'Connell's Invasion whilst he was at St Lawrence's, as far as can be ascertained during the late eighteen-twenties; and we know (see more below) that Walker was in Orford Hill at around 1837. 14. We cannot, then, be quite sure which date for issue of Walker's shopkeeper ballad applies although the 1840s look to be the favoured time. Elsewhere in the Bodleian collection and each with a slightly different appearance, two printings have 'Orford-Hill' on them, one other 'St. Lawrence's' and another has 'Church Street, St Mile's' - all, we will find, locations for Walker's printing activities. 15 Type-face does not appear to be noticeably altered and both upper and lower cases were used for the addresses in the way that the designation 'Walker, Printer' Norwich' appears. Ultimately, the brief designation on those fourteen sheets of Walker copy noted above is not one that can be easily attached to any one period - in the way, say, that items from Walker's early Duke's Palace venture can. It is not possible, as a result, draw any significant conclusions from any of this circling round unyielding detail as described here except to underline Walker's continued production, to note that all the addresses given are by now becoming familiar locations, to show that the most of Walker's printing career is represented in the Bodleian archive and to illustrate something of a printer's idiosyncratic way of presenting himself in exactly the same way on various items in both the Bodleian and Colman sources. This does not help in dating copy but could be a useful perspective on the way that printers worked. , from Jennings and Pitts' The Sun From The East and Walker's See The Conq'ring Hero Comes with Evans' Second Thoughts Are Best (again, these are but examples). Whilst there was a whole Evans clan operating in London the Long Lane address on copy (at numbers 41 and 42) narrows the field somewhat to dates between 1791 and 1828. Even more dramatically, according to the British Book Trade Index, there was only one John Jennings in Water Lane, the address on copy in this set of combinations of pieces from Jennings and from Walker - between 1802 and 1809. This must be viewed in the context of the Jennings family business operating from the 1790s on - which date the Bodleian confirms - but the particularity is striking. The overall impression is still somewhat too indefinite in nature to be able, with any facility, to extract any clue to a precise period for dating of Walker pieces - or, for that matter, any pieces where the activities of other printers are concerned. Further still, the Pitts addresses are inconsistent, from both 14 Great Saint Andrew Street (before 1819) and at 6 Great St Andrew Street (after 1819). The better help to place Walker in historical time at the Duke's Palace address is got from what we know about him at Bridewell Alley and then at St Lawrence's Steps (following Duke's Palace). Given also that the Bodleian cache, alongside those pieces from Walker, includes some from Haly in Cork whose active period was between 1821 and 1843 (his daughter printed between 1856 and 1870) and from Sanderson in Edinburgh, the latter very much a 'late' printer, it becomes clear that editorial jurisdiction has thoroughly mixed the goods. It should be added that some of the Bodleian pieces are replicated in the Colman collection. One might argue something of a prolonged diversion from the main thrust of this article but the Bodleian archive is worth concentration. In the end it offers clear evidence for the nature of activity at the Duke's Palace address and something of its extent in the summation (of sorts) of production as represented by those fifty-one titles. There could, of course, be further additions in so far undiscovered sources. If there is no clear date for Walker's first printings from the Duke's Palace address detail on Duke's Palace copy and elsewhere given below will still allow us to submit some parameters for Walker activity there. For instance, there is a piece issued by Walker from the Duke's Palace address entitled A Battle Fought Between Painter and Sutton (written by a 'J. Parkerson Jnr.' who figures in several other Walker printings). 19 We know that this fight took place on August 7th 1818 so this date is again highlighted as another possible dividing date between Lane and Walker (even if joint ventures took place in 1820 as the Dodd volume, discussed above, shows) and for estimating the beginning of the Duke's Palace years; certainly a date before which the piece could not have appeared. The relevant period for Walker's earliest separate ventures at Duke's Palace, then, can begin to be circumscribed c.1818-1820 and after this time it becomes clear on copy that Robert Lane and Robert Walker were printing separately, through the months of the Queen Caroline affair of 1820-1821, and then up until the middle twenties at least when Robert Lane 'disappears' from immediate view. We also recall the christening of Walker's two elder children, Mary in 1821 and Robert in 1825, in St John, Maddermarket coincidental to Walker's printing out of the nearby Duke's Palace address and then Henrietta's christening in 1827 at St Lawrence's that allows us a morsel of understanding of when Walker changed domicile. As a whole these details both confirm limits to the connection between Lane and Walker and 'allow' printing by the two men together, as those pieces with Napoleonic themes cited above and then the separate issue of Sandy the Waterloo Man (Lane still in Bridewell Alley) and Loss of One Hero (Walker at the Duke's Palace) both post-1815, all illustrate. The Queen Caroline episode is interesting too in that, despite much evidence of retrospection where public figures and then printing of ballads are concerned, discussed before in this series and then again above, it is unwise to think that this was always the case. Such pieces, it now seems, must be judged singly as the contrast (the point, admittedly, is being a little laboured here) between the issue of Walker's Abercrombie piece and of the Queen Caroline pieces described above demonstrates. At least the Caroline pieces, all issued from the Duke's Palace address, confirm absolutely Walker's activity there during 1820-1821. But the Duke's Palace address on this piece is important because it does seem to reveal a particular period of issue that has been established as having begun between 1818 (the Painter and Sutton piece) and 1821 (the end of the Queen Caroline years affair). There are, unfortunately, no Samuel Lane compositions in the Colman collection made for Walker at his Duke's Palace address: all were issued when Walker was at St Lawrence's or after. Nor are there any Samuel Lane pieces for Walker in the Bodleian assemblage of Duke's Palace pieces. So this one stands out. There are, however, three Samuel Lane pieces to be found on the Norfolk County Council website that, like the 'Derrydown piece', offer no clue as to Lane's address but give Walker's as being at the Duke's Palace. These are John Hodges Visit to Norwich To See the Gas Lights which would have been issued around 1820 when gas lighting was first introduced to Norwich; The Norfolk Militia, so far undateable; and, likewise, Fox Dinner, in memory of Charles James Fox. It is, of course, quite possible that the Derrydown piece was issued after 1821 but this would still have been before 1827 when Walker was in St Lawrence's; and so - in a seemingly trivial detail - parameters begin to join up. As summary: historical timing for the Duke's Palace as a location for Walker seems to have extended from c.1818 up until the late 1820s when the christening dates of two of Walker's children at St Lawrence's in 1827 and 1829 supply firm evidence of some sort of change of premise as domicile and, it seems, for immediate business purposes and we then begin to come across increasing evidence that Walker printed at St Lawrence's Steps. In this connection, there are yet more pieces by Samuel Lane in the Colman collection (and, of course, in different sources) when Walker had obviously moved from Duke's Palace. For example, there are a host of printings that have an address at Charing Cross for Lane - Charing Cross is a thoroughfare leading from St Lawrence's towards the market area of Norwich - and this address, as noted earlier, can be seen to correspond in part to a time when Walker was working out of St Lawrence's during the latter part of the 1820s. The fact that Lane's address can also be associated with Walker during the latter's domicile in St Michael's, Coslany does not alter the validity of the prior dates at St Lawrence's. The nature of these pieces will be examined more fully in a forthcoming piece but can safely be said to deal in large part with local events, particularly elections and political manouevring. Again, Samuel Lane's address, on some copy, is given as being at St Gregory's. The London Establishment, discussed briefly above, has him at St Gregory's (c.1829 according to the hand-written date on the piece) although, in this case, Walker's address is given only as 'Printer, Norwich'. More clearly, Earl Grey's Martial Law, pinpoints Samuel Lane at 'Thoroughfare Yard, St Gregory's' and Walker at St Lawrence's. Grey took office on 22nd November 1830 and detail on copy suggests that the piece referred to the Irish Coercion Bill of 1833. 32 Thoroughfare Yard is off Magdalen Street, to the north of the city centre, just along from St Lawrence's Steps. Samuel Lane, though, leads us a merry dance. He is at Thoroughfare Yard when Walker had moved to 'Orford-Hill', as indicated on another Norfolk County Council piece, The Runaway Ministers. 34 One other of Lane's ballads, The Sprowston Goose, this time in the Colman collection, has him at 'Thoroughfare Yard, St Gregory's' and with Walker at 'Orford-Hill' - at that time the current way of printing the address. 35 Yet another printing, The Gold Day Feast for the Tax Eaters, has Lane at 'Thoroughfare Yard' although there is no address for Walker. 36 All told, whatever the slight discrepancies, there is some degree of help in dating Walker's and Lane's association. The said Pump was erected as early as 1576 by one Robert Gybson and according to Mackie's Norfolk Annals, was, in 1821, receiving a new coat of paint so it was evidently held in some kind of affection or even veneration in Norwich. 39 The Pump was located on the other, northern side of Westwick Street from St Lawrence's Steps (the one-time Anchor brewery, now an accommodation block, occupied the site) - a matter of yards away. 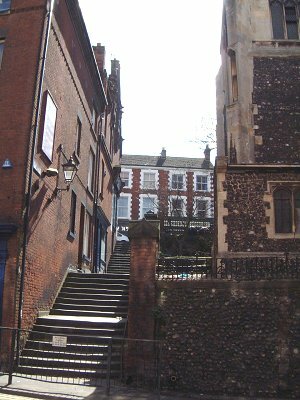 The use of the word 'near' suggests that Walker was working out of premises on the Steps themselves; at the eastern end of the church of St Lawrence's (steps at the western end were known as St Lawrence's Passage). Since the possibilities on the Steps are physically constricted, it may be that the present buildings represent the actual spot where Walker printed. Whatever the case, the association of that 'near the Pump' and the definite identification of a Walker address at St Lawrence's Steps seem further to bind the two locations as one and the same and, even though there are no precise dates, help cement the Robert Walker and Samuel Lane association. Samuel Lane's removal to London can be confirmed although, like most detail concerning Lane, its timing remains unclear. The obituary gives no dates. We do know from copy in the Bodleian archive that he was there when Jenny Lind paid her second visit to Norwich in 1849 - there is an address simply recorded as 'London' on a Lane piece about the visit, printed by Walker from 'Church-st, St Mile's' (sic); this latter, as will be seen, a fairly 'late' time in Walker's history. 41 Other pieces in the Millenium library Colman collection such as The Landowners Thrown Overboard again give Lane's address in 'London' and have Walker at 'Church St, St Mile's' (sic). 42 We know from personal details given at the head of this article that Church Street was Walker's domicile from at least 1841 on. Three pieces on the Norfolk County Council website, also giving Walker's Church Street address, have Lane in 'London'. The first, The Landowners thrown Overboard, clearly duplicates the Colman collection ballad - or vice versa. The second is entitled The Norwichers Cooked Again. The third piece, The Tea Shop Humbug (another Colman 'repeat'), gives a Walker address as being at St Martin at Oak. 43 The latter piece especially confirms not just the period of Lane's own London sojourn but a relatively 'late' period of Walker activity, St Martin at Oak being a Walker location associated with the 1840s that has puzzling ramifications, first raised by some street directory entries and as will be seen further below. Two more Colman pieces give Lane's address as 'Hackney' and Walker's immediately contemporary printing address as 'opposite St Mile's Church' (sic). 44 Apropos Samuel Lane, we are none the wiser yet in knowing the location of Sheep's Head Court, London. The available material is very slow to yield the extra tid-bit that would enable us to posit definitive dating of the whereabouts of the principals. Nonetheless, together, these pieces demonstrate Lane's concentration on local Norfolk events and issues - in one way, he never left. In turn, they highlight Walker's growing concentration on local affairs. Finally, as described in a previous article, we recall Walker's piece on the execution of Richard Knockolds, issued from 'St Lawrence' and dated 1831. 52 It is worth adding that Walker copy inevitably has the location printed out as here - 'St. Lawrence'. It looks, then, as if Walker's activities in St Lawrence's began at around 1827 (the date of Henrietta Walker's christening at St Lawrence's) and continued at least until 1831. Unfortunately there does not, so far, appear to be much clearly dateable copy from 1827-1829 to confirm activity except that The London Establishment may give us a clue. After this time, at any rate, Walker moved from St Lawrence's to Orford Hill, south of Norwich city centre; and his transfer there - we remind ourselves - represents the only time that he moved out of the general St Lawrence and Coslany areas. This Orford Hill sojourn was a productive period of operation. We have a tentative date for its beginning since there is a piece entitled King William and the Whigs from the Orford Hill address marking the change of government under the new King when Wellington left office and the Whigs came in under their leader, Grey - precisely on November 22nd 1830, although the nature of Walker's printing is general and, in any case, aforementioned dates of 1831 for St Lawrence's - in the Knockolds execution piece, for example - precludes any more precise dating. Furthermore (a reminder), the reference in the piece to Queen Adelaide could not have preceded her coronation on September 8th 1831. This piece was one of Samuel Lane's compositions written whilst he was in 'Charing Cross' (for Lane, as mentioned before, this was a relatively stable period and although he is known to have moved on from there to Coslany). 53 We might surmise a date for change of premises for Walker from St Lawrence's to Orford Hill c.1831. To support this suggestion there is another Orford Hill piece from Samuel Lane at Charing Cross entitled Lord Althorp's budget that can most likely be dated from a time after the budget of February 1831; one would think not too long after if maximum commercial benefit was to accrue to the printer at a time when Samuel Lane and Walker appear to have issued printings commenting on events and personalities in Norwich almost on a daily basis. 54 Althorp, be it said, was dismissed by King William in 1834. There are, in total, thirty-nine printings out of Orford Hill in the Colman collection, thirty-five of which are attributed on copy to the pen of Samuel Lane, the majority of these having Lane's 'Charing Cross' address on them. The conjunction of writer and printer helps to give us a strong impression of the association between writer and printer. It can be seen to have become established as a matter of routine. When, exactly, Lane moved from Thoroughfare Yard to Charing Cross is not known. There is also an important snapshot to be placed against Orford Hill activities. One piece out of the thirty-nine aforementioned in the Colman collection, from Lane's pen, stands out by reason of its address: The Rout Comes For the Whites, a piece with local subject-matter, by Samuel Lane 'Printed by R Walker, Timberhill Street, in the parish of St John of Timberhill, in the city of Norwich'. 60 Timberhill Street, south of Norwich Castle, joins Orford Hill, as shown on the accompanying map and in photograph four and it may well be that the two addresses at the apex of the junction between the two roads were, in actuality and as in other Walker circumstances noted above, one and the same. The years at Orford Hill begin to take an inclusive shape, beginning, it seems, at some time during 1831 and ending in 1840. The census details for 1841, we remind ourselves, place Walker in Coslany. We turn next to consider other Walker addresses as they appear on copy in the Colman collection in the Millenium library, firstly St Miles. We know from the Randalsome execution piece that Walker worked out of St Miles in 1840 - and from census details that he was domiciled in St Michael's, Coslany in 1841. We remind ourselves that the names St Michael's and St Miles' refer to the same church. We also know, again from sources discussed previously in this series, that a Walker piece on the execution of John Jones and issued from 'White Hart, St Mile's'(sic) dates from 1842.
surely one and the same since his son, Robert, was then only aged 17. We know from the Walker Randalsome piece that 'White Hart' was an address for issue in 1840, positing a narrowing period of time - a matter, it seems, of digging out a month rather than a year, impossible as yet - during which Walker moved from Orford Hill; and it is worth recording that a list of licensees has a Harry Kemp in the White Hart in 1839 and that this list might indicate that the particular licensee worked up until the next date given which, in this case, was 1842 - it is admitted that this by no means certain. Further still, although there might be a slight element of confusion in the details, there is a Walker printing entitled The Norfolk Heroes that concerns the Crimean war (1854-1856) and was printed out of 'St. Michael's Coslany', the current (1851-1861) address for Walker's domicile as it is rehearsed in census details. 73 Here, if the 'Craven & Co.' street directory date of 1856 to St Miles is also taken into account, a dual reference to St Miles and to St Michael, Coslany becomes evident. The answer to this puzzle, already canvassed, lies in usage of the dimunitive, apparently not an unusual occurrence in Norwich at the time where the particular building was concerned. The apparent dichotomy exposed in the 'Craven & Co.' 1856 street directory and the census details for Walker senior of 1841, 1851 and 1861, between St Miles' and St Michael's, Coslany as locations for printing, and the simple explanation that St Michael's, Coslany (the church) was also known as St Miles', leaves us with the inference that Robert Walker senior's domicile in Church Street, St Michael's, 1841 to 1861, covers all the dates canvassed for activity at the St Miles' and St Michael's, Coslany addresses. Further, 'White Hart' seems to have also been one and the same as location with 'St. Mile's' and 'St. Michael's, Coslany'. The final piece in this particular puzzle is then to determine if 'White Hart' was the same location as Church Street, St Miles - not possible at the moment but on the other hand not, strictly, a handicap, since the area in Norwich referred to by the several names noted here is quite specific: a matter of square yards. And all the concentrated information looks as if it confirms a single site for printing purposes (rather than the group of buildings noted previously). All in all, the outline period for the St Miles years seems to extend from 1840 to 1863 (perhaps beyond this date, Walker senior dying, we remind ourselves, in 1868) and encompasses the St Miles street directory references of 1854 and 1856 - when the two addresses of 'White Hart' and Church Street, one and the same, were used. There is, though, a big problem, that has already surfaced and brings us to our last locations. We take first an execution piece on Saville (discussed in a previous article), issued from St Martin at Oak, that dates from around the execution itself on 8th August 1844. 76 And there is also a piece on the Norwich politician, Ben Smith (we have already encountered Smith and his Wet Nurse), entitled A Dialogue Between Ben Smith And The Marquis of Douro and issued from St Martin at Oak 77, that, like the Saville piece, seems to compromise the St Miles address. Douro, Richard Arthur Wellesley (1807-1887), the son of the first Duke of Wellington, was involved in elections with Ben Smith in Norwich in both 1837 and 1841. He represented Norwich as MP with Ben Smith between 1838 and 1847 (and from 1847 until 1854 with Samuel Morton Peto) but we can take the Ben Smith reference in the title of Walker's piece to be to the period between 1838 and 1847. It would not have been in 1837, the time of Douro's and Smith's first encounter, because Walker senior, who issued ballads on that encounter as noted above, was then still at Orford Hill and there was no possible confusion of addresses - St Miles and St Martin at Oak - at the time; and, what is more, Walker junior was still in the family home in St Michael's, according to the 1841 census. This still leaves us with quite a choice of year of issue for the Walker piece but a reference in the piece to Peel as Prime Minister (between 1841 and 1846 - his second ministry) and, specifically, his introduction of income tax, should imply currency around 1842. A further internal reference in the Douro piece to troubles in Ireland and Canada would seem to highlight the famine years beginning in 1846 and the problems in Canada that ensued as a result of vastly increased Irish immigration. This just about puts the piece within the boundaries of the Douro and Smith association until the time when they parted elective company in 1847; but the clash of possible location for printing between St Miles and St Martin is clear; and if we take the churches themselves as geographical markers then there is some distance between the two - St Miles to the south of St Martin at Oak (see map). In all this we have the hitherto unexplored factor of White's street directory date of 1845 for 'Oak Street' that helps to confirm a possible time of issue although it does not help identify the Walker mentioned - if we take 'Oak Street' to be one and the same as 'St. Martin at Oak' (the latter is situate 'on' the other geographically). So who did issue this piece? This would still put the piece, from St Martin at Oak, in the middle of St Miles operations. A group of 'railway' pieces exacerbates the problem. Railway Trips, issued from White Hart, St Miles' (a Lane piece from Coslany Street), about the new line between Norwich and Yarmouth 'soon in use', has a handwritten date of April 27th 1843 on it. Mackie noted the formal opening of a railway line in Norwich on 30th April 1844 (the first completed through railway line from London via Cambridge to Norwich was actually opened in 1845). But Travelling By Steam; Or, The Opening of the Yarmouth and Norwich Railway, clearly referring to the event, is a Walker printing from St Martin at Oak. Similarly, The Benefit of Railways, written by Samuel Lane (in St Michael's, Coslany) has Walker at St Martin at Oak yet again. . 80 Here we have a slightly complicated situation. Only one piece looks to have been issued by Walker senior. There is no obvious explanation for why there was an apparent coincidence of printing work at the two premises, St Miles (and its associated names) and St Martin at Oak, the latter during the period between (roughly) 1843 and 1846. To account for these clashes, we can only assume that printing in Oak Street - St Martin at Oak - came from Walker junior. There are, though, related problems. First, there is a Walker piece on the attempted assassination of Queen Victoria and Prince Albert, wrongly dated on copy to 1804, and more probably issued around 1840 when the actual event occurred - but from Bridge Street, St George's. In this case, even if we assume that this piece was issued by Walker junior, there is a likely clash of the St Martin at Oak and Bridge Street addresses. Second, a large format piece in the Millenium library, A full account of an Interesting discovery and release of JOSEPH FORBES, An Englishman, after SEVENTEEN YEARS slavery among Savages, refers to the event when Forbes was 'picked up at the island of Timour Laut, in Torres' Straits, on 1st April, 1839'. Web sources confirm Forbes' captivity between 1822 and 1839. The Walker piece, as news, might be thought to have seen the light during late 1839 or early 1840. At least a date is given before which it could not have appeared. But it, like the piece on the abortive assassination noted above, was printed at Bridge Street, St George's. If Walker senior was, as has been pointed out, in Orford Hill in 1840 and, taking into account the Randalsome execution piece at 'White Hart' as well during the same year, where and when, exactly, does Bridge Street, St George's fit in and when was the Torres strait piece printed? The answer must be that the piece was printed by Walker junior and, probably, retrospectively. 82 He was, after all, in the family home in St Michael's, Coslany in 1841 and does not appear to have been a printer in his own right as far as can be determined. Or was it precisely at this point, in 1841, that he emerged as a printer (the first clear reference to Bridge Street involving Walker junior is in Mason's street directory of 1852)? We do note '& Co. Printers' on the piece from St Miles, Sir Robert Peel and his budget (c.1842). 83 Perhaps Robert Walker junior was involved as '& Co.' in the family concern and gradually assuming a separate printing identity. After 1841 we know through electoral rolls that he remained in the family home (or at least in touch with it) until 1851 and from the 1851 census that he was then living in St Augustine's, one of the northernmost parishes in Norwich. At the same time he could have occupied a different address and worked from there - a reasonable enough possibility. To 'complete' Walker junior's life-history, we can turn to the 1861 census showing this Robert Walker domiciled at 'Church Alley, St George's of Colegate' as 'Compositor (printer)'. Further, in the 1871 census Robert Walker junior is at Heigham, Norwich (presumably where Heigham Street is situated in Norwich and evoking memories of Walker junior's marriage in 1849) although the 1871 electoral roll has him at Church Alley still (perhaps another case of the existence of domicile and work premises?). In 1881 he re-emerges as a fully-fledged 'Printer' in St Augustine's. None of the latter locations can be mistaken for Bridge Street, St George's. It really does look as if Walker junior lived at one address (and more) and printed from a different one. Robert Walker junior, then, as far as evidence can be interpreted at this point, looks to have been printing from St Martin at Oak during the 1840s as perhaps confirmed by the Saville execution printing of 1844 - an eliptical view to that first promulgated when Walker execution pieces were considered in previous articles - and the 'Oak Street' directory entry of 1845. The Ben Smith and Douro piece, discussed above, might then have come out of the middle 1840s, probably in 1846. Subsequently, as entries in street directories from Mason (1852), White (1854), Kelly (1865), Mathiesen (1867) and Craven & Co. (1868) make clear, Walker junior operated out of Bridge Street, St George's; and we recall those census details indicating that Walker junior was domiciled in St George's, Colegate - one and the same, it appears, with 'St. George's' - in 1861. We are left then with the Torres Strait piece that may simply have printed retrospectively - and by the son. We should not forget the case of John Swepson Merry, who looks as if he had been installed as printer in his father's business aged 16 when the father, Charles Barber Merry, was imprisoned for bankruptcy in 1835 and when the son was still an apprentice. Further, two premises for printing are connected with the Barber family, in use at one and the same time, and it may have been that the father printed at one and his daughter, Mary Anna - who eventually took over the family business - at the other. In this light, questions about possible family arrangements for working out of more than one location can all - perhaps - be confirmed and we may well assume, therefore, that it was Robert Walker junior who printed the Torres Straits piece. 84 But the clash between St Martin at Oak and Bridge Street as printing addresses remains when the assassination piece is taken into consideration. So far no resolution of this problem has been possible. Walker senior cannot be implicated in this issue. Did Walker junior print it, too, retrospectively? Perhaps we fall back on idiosyncracy amongst printers! What we are left with is a 'disputed' period and we can only sum up in a not particularly satisfactory way. It is suggested, tentatively, that it was Walker junior who printed at St Martin at Oak whilst his father still operated at St Miles'; and that Walker junior moved to Bridge Street, St George's at some stage during the 1840s. Whatever the case, we do, at the last, have a reasonably full picture of Robert Walker senior's career (and some knowledge of that of his son) and, whilst unresolved problems as described above are frustrating, the extent and variety of the life and output of Walker senior is clear enough. 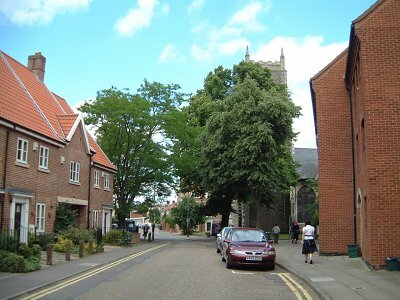 We note how he moved around Norwich as opposed to, say, Besley in Exeter, Williams in Portsea, Hurd in Shaftesbury, Pollock in North Shields, Ringham in Lincoln and Willey in Cheltenham who all remained in one place; but he does not otherwise seem to have existed on the breadline if the stability of the St Michael's, Coslany home address is anything to go by. A solid printing life would appear to have extended over a half-century at least which factor may underline Walker's relative comfort; in this respect, aspects of his jobbing career surface, ranging from a small variety of printing (perhaps there is still more to unearth here) and inclusive of a spell, apparently, as innkeeper. His two major associations, with Robert Lane and with Samuel Lane, are clear enough. He became a freeman - one sign also of his social and, possibly, financial standing, that is also underlined by his inclusion on electoral rolls as owner and occupier. Walker's is a complex enough case by all accounts - and it is still likely that some of the details given above will need to be revised in order to account for lacunae and if more information surfaces. In the next Norfolk piece some attempt will be made to assess the extent and nature of Walker's output following clues and suggestions already made in this piece and in the piece on his murder and execution ballads (almost inevitably this will involve overlapping and repeating certain features). 1. I am grateful to the staff at the Millenium library, Norwich, for help over a period of time, and, in particular, to Wendy Sterry, who has patiently both answered a myriad questions and supplied material, and Eve McClure who, latterly, has provided key information; to the library also for permission to use the 1849 Muskett map of Norwich in its possession; to the Bridewell Museum in Norwich and John Renton for help in identifying certain activities of Robert Lane and Robert Walker and the geography of Norwich and for supplying material; to the Bodleian library for permission to quote from copy; to Kerry Meal and the Lowestoft Record Office for information; and to Keith Chandler (South Leigh) for aid in the assemblage of dates for personnel. Various Rootschat correspondents have also provided invaluable help. I am very much in debt to Howard Marshall and his wife, Carol (Old Buckenham), who have provided long-term hospitality; and to Howard for help in tracing material on numerous occasions and for his photographs. 2. For information on how printers scraped on the breadline see, for instance, my article in this series on Charles Barber Merry (MT 129) where debts, bankruptcies and fires are discussed. 3. Records indicate that Robert Walker was christened on November 24th 1793. Robert Walker's wife, Ann was born on January 28th 1798 at Wood Dalling, daughter of Clement and Elizabeth. Her maiden name is spelt variously as 'Risebury' and 'Riseberry'. Children were christened as follows: Mary Ann Elizabeth Riceberry on September 30th 1821 at St John Madder Market, Norwich, Robert on August 7th 1825 at St John Madder Market; Henrietta on June 10th 1827 at St Lawrence; and Isabella on May 24th 1829 at St Lawrence. 4. For Walker's status as freeman see Norwich City Freemen 1752-1981, transcribed and edited by Shirley and Keith Howell (pub. S and K Howell), 1999; a volume in the Millenium Library, Norwich. 5. House numbering in an odd and even system, according to Eyre's 1890 Norfolk directory, was applied only at a (then) recent time. This is a relevant detail where Walker's premises at the latter end of his career are considered (as here below). 6. A Post Office directory for 1858 has a Robert Walker at 'Church st. St Giles' - which, surely, involves a misprint in the final word. A catalogue of The Writings of Norfolk Men And of Works relating to the County of Norfolk. In The Library of Mr J J Colman, At Carrow Abbey, Norwich (Norwich 1896). This volume is found at the Millenium Library, Norwich. Colman, Volume IV. Since none of the Colman volumes are paginated all other footnotes involving the Colman collection merely refer, as here, to the relevant volume. For the 1826 elections, see The Norfolk Official Lists From The Earliest Period To The Present Day, Compiled From Original Sources With An Introduction By Harman Le Strange (Norwich, Agus H Goose, Rampant Horse Street, 1890), p. 145. 9] A Bodleian Allegro archive version of text from Walker gives the title as Crib and Molineau (Harding B 25(445). Ford of Sheffield also printed it - as Crib and Molyneaux (Bodleian Allegro archive as Firth c. 19(22). The latter copy presents us with one of our familiar dilemmas. The Bodleian archive tells us that the particular printing came from W Ford of York Street, Sheffield. The British Book Trade Index gives us further glimpses. It would appear that the printer was William Ford who printed from 8 Change Alley, Sheffield, during 1828-1829 and, thereafter, up and down York Street between 1834 and 1841. Of course, these dates are highlights and Ford was most probably printing in between times. However, his Crib and Molyneaux piece cannot have been other than wholly retrospective. This leaves the Walker and Lane printing as a sort of progenitor if the Bridewell Alley address and the dates that the two printers worked there together, are taken into account - subject, as always, to fresh discoveries. the first is a more general piece on Napoleon taking into consideration his sallies into Germany, Russia, Prussia and against the Dutch and throughout dwelling on the presence of the Prince of Orange as opponent - 'The Prince of Orange shall be King' - who was present as Wellington's ally at the battle of Waterloo: the piece is found in the Bodleian Allegro archive as Johnson Ballads 1977; third, Runaway Boney or The white cockade, printed and sold by Lane and Walker, St Andrew's, Norwich and to be found in Bodleian Allegro archive as Harding B 25(1677) and, in another copy as part of a set of three pieces, Harding B (3367); fourth, A crocodile's tears; or The Sighs of Boney (written by L R Shilling, a name that crops up more than once on Walker copy) and printed by Lane and Walker in St Andrew's, Norwich in Bodleian Allegro archive as Harding B 16(65b); fifth, The bombarding of Paris; or, Boney's last blow (written by J. Parkerson, Jun. - this name also crops up several times in connection with Walker's full output), printed by Lane and Walker in St Andrew's, Norwich in Bodleian Allegro archive as 2806 c. 18(37) and Harding B 25(244); sixth, The Triumph of Peace, written by L R Shilling and to be sung to the tune of The son's (sic) of Albion, in Bodleian Allegro archive as Harding B 11(3367) with Runaway Boney and The royal clearstarcher, a political squib, in the set of three as mentioned above; and, lastly, The Devil and Bonaparte (from the two printers at 'St. Andrew's') in the Colman collection of ballads, Vol. II. This clutch of Napoleonic material (inclusive of Sons of Albion) will be given more consideration in the next Walker piece in the series. Finally, there is one more piece, entitled A New Song Of A Bad Shilling 'Composed by S Lane' (see text for Lane) and printed and sold by Robert Lane and Robert Walker from St Andrew's, that uses the tune Runaway Boney - a date around or after 1815 being, therefore, implied. ', 1901), Vol. I, 1801-1850, p. 167, entry for 'Feb. 1819'. 12. For Christmas, see Bodleian Allegro archive as 2806 c. 18(61) and Harding B 25(375a). See also footnote 19. See Sandy the Waterloo man in Bodleian Allegro archive as 2806 c. 18(280) and Harding B 25(1733) printed by Lane and Co. Bridewell-Alley, St Andrew's, Norwich - and also Sally in our Alley printed by Lane and Walker in 'Bridewell Alley, St Andrew's' (Colman collection, Vol. II): a reference emphasising the fact that the two addresses are, in fact, one and the same; and then Loss of One Hero (Walker alone from his Duke's Palace address) in Bodleian Allegro archive as 2806 c. 18(190), Firth c. 14(40) and Harding B 17(171b). For Nelson material see MT articles 166, 172 and 173. 13. The Shopkeepers' Rebellion is in Colman Volume IV. 14. King O'Connell's Invasion can be found in Colman Volume I. References in Mackie's Annals to O'Connell, cited here, come in Vol. I, p. 367; and to the Chartists on p. 378. 'Church street, St Mile's' (sic) (same source as Firth c. 19(203) and Firth b. 34(150), this time printed with Jenny's Complaint of Polly Parker 'Sung by Mr. Newton, at the Theatre-Royal, Newcastle, with unbounded Applause'), n. i., an example of how Bodleian material was assembled. 16. Some of these pieces will be considered in more depth in the next Walker article. a James Thomson poem, issued by Pitts. There are no Abercrombie printings anywhere that offer any substantial evidence for precise dating of issue. This phenomenon was discussed in a previous article but it is pertinent to remind ourselves that John Jennings, working out of 15 Water Lane, London between 1802-1809 (possibly the same Jennings since 1790 but no specific address is available), printed a piece that may well, then, have been absolutely contemporary; and that Clouter in Bristol issued the piece after he commenced printing in 1803. Pitts printed the ballad piece from 6 Great Andrew Street and this must have been in or after 1819, when he moved premises from number 14. In respect of Pitts we know of a possible connection between himself and Walker already described in this series, Walker appearing to adopt the same type of paper. Walker may, then, have got copy from Pitts. 1801, the actual time of Abercrombie's demise, comes nowhere in these stakes. 19. There are two printings on the fight between Painter and Sutton in the Bodleian Allegro archive, one as 2806 c. 18(16) and a second as Harding B 25(135). The first is set with Mr. Barney, from Walker, and Bartholomew Fair, from Pitts and it is clear from the different print-types and the arrangement of the pieces - with the edges of the printings showing, for example - that they came from different sources. Similarly, the second issue is set with a piece on a fight between 'Spring and Langan', a Pitts printing. Yet again a Bodleian method of presentation is exposed that allows no dating via a comparison between the activities of different printers. The information about Painter and Sutton came via the Lowestoft Record Office (in April 2005) and, whilst no publishing details were given, the staff referred to Old Bungay, by Ethel Mann and A Common Privilege: The Story of Outney Common, Bungay, by Terry Reeve. 20. For the Southey piece, see Colman Volume II. For Merry, see MT article 129. 21. The King's Speech piece comes from a boxed collection in the Millenium library, Norwich (not available on the open shelves) that contains a variety of pieces from several Norwich printers. 22. Walker's ballads on the Queen Caroline affair pieces come from boxed collections, already cited, in the Millenium library. Together with those from Robert Lane mentioned below, they will be considered in more depth in an article, in preparation, on the Queen Caroline affair. They mirror - and duplicate - pieces from other printers as mentioned immediately in text here. (MacMillan, London and Basingstoke, 1997 Papermac edn.). Set and annotated by Edgell Rickword (Bath, Adams & Dar), 1971.
in Madden Reel 74, Number 642. These pieces are merely examples of a much larger number, the bulk of which, as found, were issued by Catnach and Pitts. Other printers, apart from those already mentioned, included Bennett in Bristol and Pollock in North Shields. 26. This piece is found on a Norfolk County Council website (easily found at Norfolk.gov.uk) which, although its contextual detail for copy remain somewhat vague in some cases, contains forty-eight pieces from Norfolk printers, some of these pieces from the jobbing side. Robert Lane's Caroline piece is numbered 47. 27. The Pycraft and Hardiment pieces were discussed in MT articles 201 and 202 respectively. The speech from the throne can be found boxed in the Millenium library as can Sale by Auction, this one large-sized. Both were issued from Walker's Duke's Palace address. Borowitz Crime Ephemera: Criminal Broadsides of 19th-Century England (No. 96). 29. The 'Derrydown' piece is in Colman, Volume I. 30. References to this Samuel Lane complex may be summed up: the three Bodleian Allegro archive pieces - The Kind Shepherd (R. Howard) the Painter ands Sutton piece (J. Parkerson, Jnr.) and The Maid I Adore ('C.D.') - can be found, respectively, as Harding B 16(121b); 2806 c. 18(16), one of two printings as described above in footnote 19; and - one of three printings, suggesting popularity - 2806 c. 18(194). The Norfolk County Council website numbers are, respectively, 7 (John Hodges Visit to Norwich To See the Gas-Lights), 10 (The Norfolk Militia) and 16 (Fox Dinner). 32. For The London Establishment see Colman, Volume IV. There is no address for Walker on copy. Earl Grey's Marshal Law (Walker at St Lawrence's) is in Colman, Volume II. 33. These two Lane ballads are numbered 19 and 22 on the Norfolk County Council website. The 'A' on the first one is followed immediately by a water-mark that may possibly conceal an 'N'. Another ballad in the same cache, Joyful News for the Poor, from Lane at Thoroughfare Yard, was printed for Upcroft in Norwich (number 23). 34. The Runaway Ministers is number 39 in the Norfolk County Council cache. 35. The Sprowston Goose can be found in Colman, Volume II. 36. The Gold Day Feast is in Colman, Volume II. There is another copy in Colman, Volume IV where the salient word in the title is given as 'Guild' and the address for Lane as 'The Yard, St Gregory's'. There is no address for Walker on either copy. In view of Lane's subject-matter and an accompanying piece on Norwich guilds, The Norwichers Lamentations For The Loss Of Their Guild (Lane in Charing Cross and Walker at 'Orford-Hill'), 'Guild' seems to be a more likely word than 'gold'. That slight change in the wording of the address on the two first pieces mentioned here would appear to indicate a reissue, thus underlining continued interest. can also be found in Colman, Volume II). in Colman, Volume I. More Impositions is in Colman, Volume IV. 39. See Mackie, op cit, p. 196. 40. Samuel Lane's obituary can be found in the Colman collection, Volume II, and comes from the Norwich Mercury for October 27th 1853. Lane's perambulations as expressed in the obituary - without a single date, it has to be said - are confirmed on a piece (number 35) on the Norfolk County Council website, A Rare Row About the Income Tax, a reference most likely to be associated with Peel's 1842 legislation. The point is that we find on it the absolutely singular address for Lane of 'St. Margaret's, Norwich'. 41. Jenny Lind gave concerts at St Andrew's Hall, Norwich on 22 and 23 Jan. 1849, having arrived on 20th. See S. M. Bishop, J. S. Buist and M. J. Flynn: Jenny Lind in Norwich - A Centenary Celebration (1987), p. 9. Jenny Lind's Concert was another piece written by Lane in London with Walker in 'Church Street St Mile's' (sic) and is found in Colman, Volume IV. Mackie's Annals confirm Jenny Lind's first visit in 1847 (22nd-25th April), Vol. I, p. 465; and the second on p. 474. 42. For The Landowners Thrown Overboard see Colman, Volume II. In the nexus of Walker and Samuel Lane association, there is a piece without imprint - but looking suspiciously like a Walker printing - from Samuel Lane in London and entitled The Charlie in a Hobble, yet again with local, Norwich, resonances (Colman, Volume II). 43. The Norfolk County Council numbers for these pieces are, respectively, 25, 31 and 41. Yet more confirmation of Lane's then current domicile is given on a piece entitled All The World Turned Soldiers, from the same Norfolk website and printed by Broadhurst in Norwich. A follow-up article is in preparation intended to extend our knowledge of other Norwich and Norfolk printers who were first introduced in the Norfolk execution articles on this site, MT 201-203, 205. 44. These are The Leisure and entertainment at Norwich Festival and The New Law Against Sabbath Breaking, both found in Colman, Volume IV. Individually, Lane and Walker were to return to comment on various Norwich festivals at intervals. 45. The King's speech of 1830 is in Colman, Volume IV. 46. Runaway Wellington is in Colman, Volume II. See also Elizabeth Longford: Wellington (London, Abacus Books, 2002 p/b edn. ), p. 425, which describes Wellington's exit from government. 47. For Peel and Ogle's Farewell see Colman, Volume III and the Norfolk County Council website, as number 30. For the defeat of Peel and Ogle and election of Gurney and Grant see Norfolk Official Lists p. 145. 48. The Morning Chronicle piece, dated 'Thursday Nov. 25th 1830', is one of the boxed items in the Millenium library, Norwich. Mackie, op cit, p. 287, refers to the defeat of Peel and Ogle and the election of Gurney and Grant as candidates for the 'Blue and White' (Whigs) on July 24th 1830. See also Norfolk Official Lists, p. 145, for Grant's election where we find that, as it happened, voting gave the Whigs two seats. 49. The jobbing piece, dated June 12th 1830, can be found as one of the boxed items in the Millenium library, Norwich. see Colman, Volume III. King William IV died in 1837, having married his consort, Adelaide, in July 1818, she being crowned Queen in September 1831 and surviving her husband until 1849. Clearly, the Walker piece must gave been issued during or after 1831. 51. Pedro I had been exiled in Brazil and, returning to Portugal, he took up the cause of his daughter Maria da Glória, whose position as Maria II of Portugal was being challenged by her uncle Miguel. Pedro I directed the political and military campaign which eventually defeated Miguel. Then, acting as regent, Pedro had his daughter declared of age, although she was less than 18 years old. A few days later, on Sept. 24, 1834, he died in the Queluz Palace. 52. Richard Knockolds was executed on 16th April 1831 - see MT article 202. 53. For King William and the Whigs, see Colman,Volume IV. 54. For Lord Althorp's Budget, see Colman, Volume IV. 56. See MT article 202. 57. For the Melbourne piece, see Colman, Volume II. and The Conservatives' Mortal Gorge are also in Colman, Volume IV. There are Douro and Smith entries in Norfolk Official Lists, p. 145, referring to the municipal elections held in May 1831; and, in addition to this reference, there is also one to the time when Douro was elected along with Samuel Morton Peto in 1847, Peto serving as MP for Norwich between 1847 and 1854. In connection with ballads about electoral business, we recall the Merry pieces commenting in the same way on the progress of Osborn, the Tory MP, in Bedford during the election of 1820 (MT article 129). 59. See MT article 202. 61. The Fat Headed Club can be found on a large-scale sheet housed at the Millenium library, Norwich. 62. There is a collection of photographs available on the Norfolk County Council website, several of which are of Coslany Street, and four of which (9, 10, 15 and 16) look to illustrate a time in the 1950s when older buildings, including the White Hart pub, still existed - and is, indeed, shown. Some details of the White Hart, including the alternative addresses quoted here, come from a Norfolk pubs website, www.norfolkpubs.co.uk. 63. Sir Robert Peel and his Budget is in Colman, Volume II. So is The New Income Tax. Peel sought only to tax those with incomes above £150 per annum, and he reduced customs duties on 750 articles out of a total number taxed of 1,200. The less wealthy were meant to benefit and trade revive as a consequence. For the Jones piece see MT article 202. 64. Addresses and dates come from the Norfolk pubs website. Nothing about the White Hart additional to the photographs on the Norfolk County Council website and the information from the pubs website has yet been revealed during present enquiry. 65. The accompanying map indicates the relevant geographical area in Norwich. 66. The Present State of the Country is in Colman, Volume I. 67. More Blessings for John Bull is in Colman, Volume II. 68. This piece is housed with the Millenium Library boxed material. 69. See the Millenium library boxed material. 70. A New Song, Jenny Lind's Second Visit To Norwich may be found in the Bodleian Allegro archive as Firth b. 34(150) and Firth c. 195203); and in Colman, Volume IV. 71. See Colman, Volume IV. Incidentally, the particular election was noteworthy because of the presence of a strong Chartist lobby that protested against the election of Peto and Douro and eventually petitioned the House of Commons. There was no redress. Further, though, Peto was a 'Liberal', Douro a 'Conservative'. There was no polling - an indication of the peculiar circumstances of parliamentary electioneering at the time: all this making up something to be considered at another time in respect of a considerable body of election material found in the oeuvres of several printers nationwide; Merry already considered in brief in MT article 129; evidence of similar election material in Coventry available in source. see Colman, Voll. II and IV; and for The Humbug of the Whig Ministry, Colman, Volume I. 73. The Norfolk Heroes (not Norfolk Heroes, a separate piece) in Colman, Volume II. 74. For Sevastopol, see See Colman, Volume II. 75. For the royal marriage piece, see Colman, Volume II. 76. See MT article 202. 77. See Colman, Volume II. 78. The piece on Father Mathew can be found in Colman, Volume II. 79. See Mackie, op cit, Vol. I, p. 431. 80. Railway Trips was printed from 'White Hart, St Mile's' and is found in Colman, Volume IV, as are The Benefit of Railways and Travelling By Steam, both issued from St Martin at Oak. The Mackie reference is Mackie, Vol. I, p.347. 81. The Benefits of Mesmerism is in Colman, Volume I. 82. The Forbes piece is in the Millenium library as a large-scale, boxed sheet. 83. For the Peel piece, see Colman,Volume II. 84. For Merry, see MT article 129.